Robert Bailey is the author of the McMurtrie and Drake legal thrillers series which currently includes 3 books. The series focuses on Law professor Thomas Jackson McMurtrie who wrote the book on evidence in the state of Alabama. His once student and enemy, Rick Drake, becomes his partner and the team now works together to solve crimes. While the series is called a thriller series, based on the so-far three published books, it is really more of a legal crime mystery series. Here are the Robert Bailey books in order for his McMurtrie and Drake legal thriller series. We first meet Thomas Jackson McMurtrie in The Professor, the first book in Robert Bailey’s McMurtrie and Drake legal thriller series. Tom is a 60 something retired professor who not only used to teach law, he was also the one who wrote the manual on evidence in the state of Alabama. Due to some issues at work and because he was diagnosed with bladder cancer, he stopped working. Problem is, not only he left things with his student, Rick Drake in bad standing but he also doesn’t know what to do with himself anymore. So when a truck accident leaves a family dead, he is asked to represent Ruth Ann Wilcox, the mother of a young woman who died in that fateful collision earlier. Even though Tom and Rick are no longer in good terms, he does ask Rick to help him win the case against Jack Willistone and his trucking company. Robert Bayley’s debut novel is a fast-paced courtroom drama that borders on being a thriller with powerful villains and a race against time. We meet McMurtrie again in the second book in the series, Between Black and White. This time, the black and white colors point to the skin colors of the people involved. Back in 1966, the father of Bocephus Haynes was lynched whereby Bo himself was present and watched the whole thing go down. In the meantime, he studied law under McMurtrie, got his license to practice law, and is now practicing in his hometown, Pulaski, Tennessee, where the lynching happened so many years before. When Andy Walton, the man who was supposedly the head of the Ku-Klux-Klan group that killed Bo’s father, is found himself dead in the very spot that the earlier murder occurred, it is no big surprise that Bo himself is accused of the murder with the motive being revenge. Except Bo didn’t do it, so now he asks McMurtrie for help in defending himself and finding the actual killer. Again, as in the first book, what follows is a cat-and-mouse game with a race against time before Bo is sentenced for good, or worse. In the third McMurtrie and Drake novel, The Last Trial, we meet Tom McMurtrie again in probably his most difficult case so far. His old nemesis, Jack Willistone, is dead, killed and left on the shores of the Black Warrior River shortly after he was released from prison. A woman, Wilma Newton, is accused of murdering him, so her 14-year-old daughter asks Tom for help. He does agree, but this time Rick Drake is not present, so he reaches out to his old friend Bo Haynes for help in solving this damning case. Since there are a ton of people who would have gladly killed Willistone, it is not easy to find the real killer. But one thing Tom knows for sure is that Wilma didn’t kill that old monster. But what even Tom didn’t account for is that the judge presiding over this very case is an old student of his who still holds a grudge against McMurtrie for believing he was not treated fairly back in law school. And, let’s not forget that Tom himself is now 70 and is sicker than before with his cancer. Things are tougher than ever before. 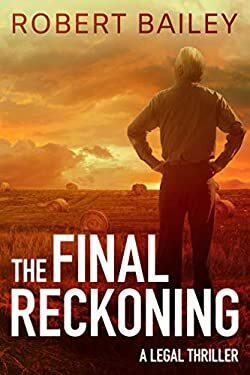 In the fourth Tom McMurtrie book, The Final Reckoning, Robert Bailey brings back the gang once again while this time raising the stakes like never before. JimBone Wheeler is an evil killer who was imprisoned and put on death row at least in part due to Tom McMurtrie’s help. And JimBone is pissed as hell. And he has escaped. Now, all JimBone has is revenge against the one who destroyed his life, and one by one people around Tom start dying and the killer’s hand. Tom knows he has not all that much to live, but he wants to be there at least until they find JimBone before he kills anyone else that Tom really cares for, even if it’s the very last thing McMurtrie ever does. Born in Huntsville, Alabama, Robert Bailey (website) attended the Davidson College in North Carolina from where he received his Bachelor of Arts in History in 1996. After his BA degree, he went to law school at the University of Alabama, where he served on the law review, which is an honor that is received only by those students who can write really well. He graduated with a degree in JD (Juris Doctor) in 1999. He has been working as a civil defense trial lawyer in Huntsville with the law firm of Lanier Ford Shaver & Payne for the last 17 years. He is married to Dixie Bailey with whom he has three children, a girl, and two boys. While he is still practicing law full time, he is now also a legal thriller author with four books published to date. His first book The Professor was published in 2014, and it received three major awards, including the 2014 Beverly Hills Book Award for Legal Thriller of the Year, the 2014 National Indie Excellence Award finalist, legal thriller and the 2014 Great Southeast Book Festival, Honorable Mention for General Fiction. It took him 8 years to finish his first novel and get it published, while he did three main full revisions to the book. One of the main characters, Rick Drake, draws a lot of parallels with the author’s years attending law school. While each book in the series can be read as a standalone, it is recommended to read the Robert Bailey books in order not only because the main characters grow, develop, and get really complex as the stories evolve, but some books (such as the first one and the third one) are directly connected through various related characters (like Jack Willistone or Bocephus Haynes) that keep appearing in several books of the series. Providing my eyes hold out, I am about to open “The Last Trial”. Your books truly fit the category of ” can’t put them down until the last page” I have been struck by the fact that so many instances in “Between Black and White” are so relevant in todays world.. Sadly I might add! Your fictitious Thomas Jackson McMurtrie, is reminding me more and more of current legal genius Mr. Robert Mueller, that says a lot about Thomas Jackson McMurtrie.. Love the location of these novels, I have lived in southern areas and in that way I relate to the laid back, country atmosphere. It would have been best to read your books in order, however that has not interfered with my enjoyment.. I hope that you will continue to feature all of the current family of characters The Professor, Drake, Bo, etc in more of your work. Respectfully, Shirley Bailey..